Spring semester is starting up at Visible Music College (though it is, by no means, spring weather waking up to 10F temperature!). We’re kicking off with what we call BLITZ classes – teaching a few general education courses over an intense, 2-week period in an effort to help students focus more on studies of their musical/production/business craft during the normal semester. One of those BLITZ gen ed classes is Public Communication. It’s actually new on the table. 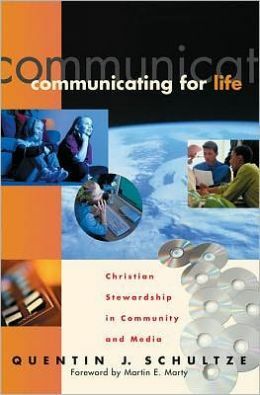 I’ll be teaching it and the main text of the class is Quentin Schultze’s Communicating For Life: Christian Stewardship in Community and Media. As I mentioned on my top reads of 2013, it’s been good to re-read this book. I’m now about half-way through and it offers some refreshing thoughts on a wide range of aspects on the topic of communication. The focus on the Public Communication class is this: We all communicate – each and every day of our lives. Whether we are in a one-to-one conversation, standing on a platform or simply listening to another, we are involved in the realm of communication. Moreover, as Christians tasked with serving our world, we are called to be responsible and faithful communicators. So that’s what the class is primarily about, as well as Schultze’s book. Now, with “communication theory,” it sounds quite dull, to say the least. Who cares about the theory of it, right? Just like we don’t care about the Pythagorean theorem! But our communication is a God-given gift to create an environment of shalom, or a focus of bringing the wholeness and well-being of God to our world through our words, listening, symbolic actions, etc. Don’t just think talking (nor just “public speaking”). Think communication as a whole. All of it, which is why we include aspects of listening and symbolic actions. I truly believe communication is life and death for people. Wrongly communicate and it can tear lives apart. Correctly communicate and it can breathe the life of God into people. Think of James’ words in 3:1-12 or think of Christ having only words of life eternal (John 6:68). Just last night, in “communicating” with my son, I failed. Failed miserably! My wife helped me see this – lovingly and graciously, I might add. I find my greatest communication failures are with my wife and children. But grace is evident – to forgive, heal and rebuild the life of God into those we damage. Grace is poured out. But then I consider situations where, by the mercy of God, I was able to speak faithfully to my wife or my two sons. Or those I’ve pastored or taught or walked alongside in life. I long for that communication more and more! I’m looking forward to the journey of this class on communication – not just for the students, but for myself as well. I’m thankful to be re-stirred in thinking about many of these aspects of faithful communication. This entry was tagged books, communication, Visible Music College. Bookmark the permalink.